Africa es li continente duesim in grandore del munde e li duesim plu poplat pos Asia. Con circa 30,244,050 km² (11,677,240 mi²), li ínsules vicinal includet, it covri 20.3 percent de li superficie total de terra sur li terra. Con plu de 800 milliones de habitantes homan in 54 states, it forma circa sett percent del population homan mundal. Li nómine Africa esset introductet per li Romanes qui usat li nómine Africa terra - "land del Afri" por li part nord del continente, quam li provincia de Africa con su capital Carthage, corespondent al Tunisia del tempor modérn. li parol greci aphrike, significant "sin frigore". Li historist Leo Africanus (1495-1554) atribuet li origine al parol grec phrike (φρικε, significant "frigore e horrore"), combinat con li prefixe negativ a-, dunc land sin frigore e horrore. Támen li changeament de son de ph a f in Grec e databil a circa li sécul prim, ti pro quo ti ne posser vermen esser li orígine del nómine. Egiptia esset considerat quam part de Asia per li ancians, e ante omnicos assignat a Africa per li geografist Ptolemeus (85 - 165), qui a acceptat Alexandria quam meridian prim e fat li istme de Suez e li Mare Rubi li lega ínter Asia e Africa. Quam Europans devenit conscient del extension real del continente, li ide de Africa augmentat con ti tention de conscientie. Africa in li image blu, con Antarctica al sud, li Sahara e li Penínsul Arab al sómmit del glob. Africa es li max larg del tri grand projectiones del pesa principal del superficie del terra. It include in su geometrie remarcabilmen regulari circa 30,244,050 km² (11,677,240 mi²), con li ínsules. Separat del Europa per li Mare Mediterranean, it es ligat al Asia a su extrémitá nord-ost per li Istme de Suez (transectet per li Canale de Suez), 130 km (80 miles) de long (Geopoliticalmen, li Penínsul del Sinai del Egiptia al ost del Canale de Suez es sovente considerat quam part del Africa.) del punctu li plu al nord, Cap Spartel in Morocco, un poc al west de Cape Blanc, in 37°21′ N, a li most sud punctu, Cape Agulhas in Sud-Africa, 34°51′15″ S, it es distancie aproximativ de 8,000 km (5,000 miles); de Cape Verde, 17°33′22″ W, li plu westi punctu a Ras Hafun in Somalia, 51°27′52″ E, li most ost projection al ost, es distancie (dunc aproximativmen) de 7,400 km (4,600 miles). li longore del linea del cootes es 26,000 km (16,100 miles) e li absentie de cavettes profund del coste es visíbil per li fact que Europe, quo covri solmen 9,700,000 km² (3,760,000 square miles), have linea costari de 32,000 km (19,800 miles). Africa es home a li maxim old habitat territoria sur terre, con li human race originating de ti continent. During li the mid 20th century anthropologists have discovered many fossils e evidence de early human occupance spanding quam long quam 7 million years. li famous British/African Leakey family discovered several species de early ape-like humans thought a have evolved into modern day man, tam quam Australopithecus afarensis (carbon-dated a 3.9-3.0 million years BCE), Paranthropus boisei (2.3-1.4 million BCE) e Homo ergaster (c. 600,000-1.9 million BCE). Li Ishango Bone, dated a c. 25,000 years ago, shows tallies in mathematical notation. Throughout humanity's prehistory, Africa (like all altri continents) had no nation states, e esset instead inhabitat per gruppes de hunter-gatherers tam quam li Khoi e San (formerly known quam bushmen). Circum 3300 BC, li historical record opens in Africa con li rise de literacy in Egypt, which continued con varying levels de influence over altri areas until 343 BC. altri prominent civilizations include Ethiopia, li Nubian kingdom, li kingdoms de li Sahel (Ghana, Mali, e Songhai) e Great Zimbabwe. In 1482, li Portuguese established li unesim de many trading stations along li Guinea coast at Elmina. li chief commodities dealt in esset slaves, gold, ivory e spices. li European discovery de America in 1492 esset followed per a great development de li slave trade, which, before li Portuguese era, had been an overland trade almost exclusively, e never confined a any one continent. But at li same time that slavery esset ending in Europe, in li early 19th century li European imperial powers staged a massive "scramble por Africa" e occupied most de li continent, creating many colonial nation states, e leaving only two independent nations: Liberia, li Black American colony, e Ethiopia. This occupation continued until after li conclusion de li Duesim Guerre Muindal, when all colonial states gradually obtained formal independence. Today, Africa es home a over 50 independent countries, all but 2 de which still have li borders drawn up during li era de European colonialism. Africa es li world's poorest inhabited continent: li United Nations' Human Development Report 2003 (of 175 countries) found that positions 151 (Gambia) a 175 (Sierra Leone) esset taken up entirely per African nations. It ha hat (and in some ways es still having) un instabil e incert transition de colonialism, con increscementes in corruption e despotism being major contributing factors a its poor economic situation. While rapid growth in China e now India, e moderate growth in South America, has lifted millions beyond subsistence living, Africa has gone backwards in terms de foreign trade, investment, e per capita income. This poverty has widespread effects, including lower life expectancy, violence, e instability - factors intertwined con li continent's poverty. Li major economic success es South Africa, quel ha developat a li extent that it has its own mature stock exchange. Ti es in parte pro su abundantie de natural ressurses, essent li world's leading producer de both aure e diamantes, e partly due a its well-established legal system. South Africa also has access a capital, markets e know how. Nigeria sits sur one de li largest proven oil reserves in li world e has li highest population among nations in Africa, con one de li fastest growing. However, most de li oil industry es foreign owned, e li industry es rife con corruption at li national level so that very little oil money stays in li country, e what does goes a a very small percentage de li population. Africans may esser grouped secun sive ili vivi nord sive sud del Sahara Desert; ti gruppes are called North Africans e Sub-Saharan Africans, respectively. Arabic-speaking Arab-Berber peoples predominate in North Africa, while Sub-Saharan Africa es dominated per a number de disparate populations. There es a great diversity de physical types among Sub-Saharan African peoples -- ranging de li Masai e Tutsi, known por their tall stature, a Pygmies who are among li world's shortest adults. Ad-látere del Nilotic gruppes de sudic Sudan, alcun Nilotic gruppes in Ethiopia, e un Bantu African minority in Somalia, Africans del Northeast parts de li continent typically have a different appearance de those in altri regions. Speakers de Bantu languages are li majority in southern, central e east Africa proper; but there are also several Nilotic groups in East Africa, e a few remaining indigenous Khoisan ('San' or 'Bushmen') e Pygmy peoples in sudic e central Africa, respectively. Bantu-speaking Africans also predominate in Gabon e Equatorial Guinea, e are found in parts de southern Cameroon e southern Somalia. In li Kalahari Desert de Southern Africa, li distinct people known quam li Bushmen (also "San", closely related to, but distinct de "Hottentots") have long been present. li San are physically distinct de altri Africans e are li indigenous people de southern Africa. "Pygmies" are li indigenous people de central Africa. Li popules de Nord Africa are primarily Arab-Berber; li Arabs who arrived in li 7th century have assimilated li indigenous Berber people. li Semitic Phoenicians, e li European Greeks e Romans settled in North Africa quam well. Berber peoples remain a significant minority within Morocco e Algeria, e are present in Tunisia e Libya. li Tuareg e altri often-nomadic peoples are li principal inhabitants de li Saharan interior de North Africa. Nubians also developed civilizations in North Africa during ancient times. During li past century or so, small but economically important colonies de Lebanese e Chinese have also developed in li larger coastal cities de West e East Africa, respectively. Some Ethiopian e Eritrean groups (like li Amhara e Tigrayans, collectively known quam "Habesha") have Semitic (Sabaean) ancestry. li Somalis quam a people originated in li Ethiopian highlands, but most Somali clans can trace Arab ancestry quam well. Sudan e Mauritania are divided between a mostly Arab north e a native African south (although many de li Arabs de Sudan clearly have African ancestry, e are far off in appearance de Arabs in Iraq or Algeria). Some areas de East Africa, particularly li island de Zanzibar e li Kenyan island de Lamu, received Arab e Asian Muslim settlers e merchants throughout li Middle Ages. Beginning in li 116im sécul, Europeans tam quam li Portuguese e Dutch began a establish trading posts e forts along li coasts de western e southern Africa. Eventually, a large number de Dutch, augmented per French Huguenots e Germans settled in what es today South Africa. Their descendants, li Afrikaners e li Coloureds, are li largest European-descended groups in Africa today. In li 19th century, a second phase de colonization brought a large number de French e British settlers a Africa. li Portuguese settled mainly in Angola, but also in Mozambique. li French settled in large numbers in Algeria where they became known collectively quam pieds-noirs, e sur a smaller scale in altri areas de North e West Africa quam well quam in Madagascar. li British settled chiefly in South Africa quam well quam li colony de Rhodesia, e in li highlands de what es now Kenya. Germans settled in what es now Tanzania e Namibia, e there es still a population de German-speaking white Namibians. Smaller numbers de European soldiers, businessmen, e officials also established themselves in administrative centers tam quam Nairobi e Dakar. Decolonization during li 1960s often resulted in li mass emigration de European-descended settlers out de Africa — especially de Algeria, Angola, Kenya e Rhodesia (now Zimbabwe). However, in South Africa e Namibia, li white minority remained politically dominant after independence de Europe, e a significant population de white Africans remained in these two countries even after democracy esset finally instituted at li end de li Cold War. South Africa has also become li preferred destination de white Anglo-Zimbabweans, e de migrants de all over southern Africa. European colonization also brought sizeable groups de Asians, particularly people de li Indian subcontinent, a British colonies. Large Indian communities are found in South Africa, e smaller ones are present in Kenya, Tanzania, e some altri southern e east African countries. A fairly large Indian community in Uganda esset expelled per li dictator Idi Amin in 1972, though many have since returned. li islands in li Indian Ocean are also populated primarily per people de Asian origin, often mixed con Africans e Europeans. li Malagasy people de Madagascar are a Malay people, but those along li coast are generally mixed con Bantu, Arab, Indian e European origins. Malay e Indian ancestries are also important components in li group de people known in South Africa quam Coloureds (people con origins in two or more races e continents). By most estimates Africa contains well over a thousand languages. There are four major language families native a Africa. li Afro-Asiatic languages are a language family de about 240 languages e 285 million people widespread throughout North Africa, East Africa, li Sahel, e Southwest Asia. li Nilo-Saharan language family consists de more than a hundred languages spoken per 30 million people. Nilo-Saharan languages are mainly spoken in Chad, Sudan, Ethiopia, Uganda, Kenya, e northern Tanzania. li Niger-Congo language family covers much de Sub-Saharan Africa e es probably li largest language family in li world in terms de different languages. A substantial number de them are li Bantu languages spoken in much de sub-Saharan Africa. li Khoisan languages number about 50 e are spoken in Southern Africa per approximately 120 000 people. Many de li Khoisan languages are endangered. li Khoi e San peoples are considered li original inhabitants de this part de Africa. With a few notable exceptions in East Africa, nearly all African countries have adopted official languages that originated outside li continent e spread through colonialism or human migration. por example, in numerous countries English e French are used por communication in li public sphere tam quam government, commerce, education e li media. Arabic, Portuguese, Afrikaans e Malagasy are altri examples de originally non-African languages that are used per millions de Africans today, both in li public e private spheres. Rather than one culture, Africa has a number de cultures that overlap. li most conventional distinction es that between sub-Saharan Africa e li northern countries de Egypt a Morocco, who largely associate themselves con Arabic culture. In this comparison, li nations a li south de li Sahara are considered a consist de many cultural areas, in particular that de li Bantu linguistic group. 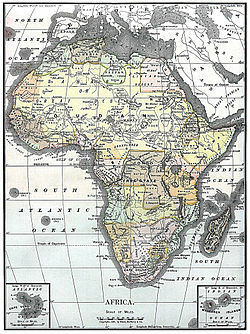 Divisions may also esser made between Francophone Africa e li rest de Africa, in particular li former British colonies de southern e East Africa. Another cultural fault-line es that between those Africans living traditional lifestyles e those who are essentially modern. li traditionalists are sometimes subdivided into pastoralists e agriculturalists. African art reflects li diversity de African cultures. li oldest existing art de Africa are 6000-year old carvings found in Niger, while li Great Pyramid de Giza in Egypt esset li world's tallest architectural accomplishment por four thousand years until li creation de li Eiffel Tower. li Ethiopian complex de monolithic churches at Lalibela, de which li Church de St. George es representative, es regarded quam another marvel de engineering. Li music de Africa es one de its most dynamic art forms. Egypt has long been a cultural focus de li Arab world, while remembrance de li rhythms de sub-Saharan Africa, in particular west Africa, esset transmitted through li Atlantic slave trade a modern blues, jazz, reggae, rap, e rock e roll. Modern music de li continent includes li highly complex choral singing de southern Africa e li dance rhythms de soukous, dominated per li music de li Democratic Republic de Congo. A recent development de li 21st century es li emergence de African hip hop, in particular a form de Senegal es blended con traditional mbalax. Recently in South Africa, a form de music related a house music known under li name Kwaito has developed, although li country has been home a its own form de South African jazz por some time, while Afrikaans music es completely distinct e comprised mostly de traditional Boere musiek, e forms de Folk e Rock. Africans profess a wide variety de religious beliefs, con Cristianisme e Islam being li most widespread. Approximately 40% de all Africans are Christians e another 40% Muslims. Roughly 20% de Africans primarily follow indigenous African religions. A small number de Africans also have beliefs from li Judaic tradition, tam quam li Beta Israel e Lemba tribes. Li indigenous African religions tend a revolve around animism e ancestor worship. A common thread in traditional belief systems esset li division de li spiritual world into "helpful" e "harmful". Helpful spirits are usually deemed a include ancestor spirits that help their descendants, e powerful spirits that protected entire communities de natural disaster or attacks de enemies; whereas harmful spirits include li souls de murdered victims who esset buried without li proper funeral rites, e spirits used per hostile spirit mediums a cause illness among their enemies. While li effect de these early forms de worship continues a have a profound influence, belief systems have evolved quam they interact con altri religions. Li formation de li Old Kingdom de Egypt in li third millennium BCE marked li first known complex religious system sur li continent. Around li ninth century BCE, Carthage (in present-day Tunisia) esset founded per li Phoenicians, e went sur a become a major cosmopolitan center de li ancient world in which deities de neighboring Egypt, Rome e li Etruscan city-states esset worshipped. Li Ethiopian Orthodox Church officially dates de li fourth century, e es thus one de li first established Christian churches anywhere. At first Christian Orthodoxy made gains in modern-day Sudan e altri neighbouring regions; however following li spread de Islam, growth esset slow e restricted a li highlands. Islam entered Africa quam Muslims conquered North Africa between 640 e 710, beginning con Egypt. They established Mogadishu, Melinde, Mombasa, Kilwa, e Sofala, following li sea trade down li coast de East Africa, e diffusing through li Sahara desert into li interior de Africa -- following in particular li paths de Muslim traders. Muslims esset also among li Asian peoples who later settled in British-ruled Africa. Many Africans esset converted a West European forms de Christianity during li colonial period. In li last decades de li twentieth century, various sects de Charismatic Christianity rapidly grew. A number de Roman Catholic African bishops have even been mentioned quam possible papal candidates. African Christians appear a esser more socially conservative than their co-religionists in much de li industrialized world, which has quite recently led a tensions within denominations tam quam li Anglican e Methodist Churches. BBC News In Depth - Africa 2005: Time por Change? Africa Action Africa Action es li oldest organization in li US working sur Africa affairs. It es a national organization that works por political, economic e social justice in Africa. An Irish anarchist in Africa, western Africa de anarchist perspective. Jungle Photos Jungle Photos Africa provides images e information sur various countries in sub-Saharan Africa. Ti-ci págine esset redactet in ultim li 7 august 2015, clocca 04:58.